Merle/Murril Elmer Middaugh. His father was Granville Middaugh and his mother was Ruthie Susanna Ford. Merle was born 28 May 1908 in Polk County, Arkansas, d 10 Oct Sulphur, Oklahoma. He was married to Mamie Beatrice Baxter, and is buried in the Restland Cemetery in Olney, Texas. His obituary follows. Sulphur - Services for Murril E. Middaugh, 76, will be 10 a.m. Saturday in the chapel of Clagg Funeral Home, with the Rev. Don Ritchie conducting the rites. Burial will be in Restland Cemetery, Olney, Texas. Mr. Middaugh died Wednesday in a Sulphur Hospital. He was born May 28, 1908, in Mean, Ark., to Granville and Ruthie Ford Middaugh, and was a retired oil field worker. He lived in Sulphur as a child, and in Texas until 1970, when retired and moved back to Sulphur. 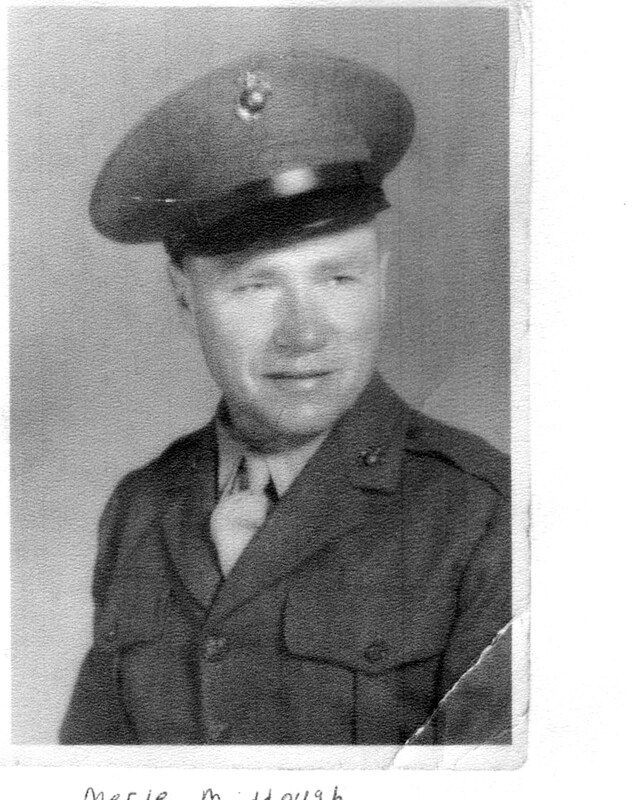 He was a veteran of World War II, serving in the U.S. Marine Corps, and was a member of the Baptist Church in Olney, Texas. He married Goldie Suther Oct. 9, 1970 in Olney. This person is listed on the Young County Service Roster Page in the original mid-1940's publication, "Men and Women In The Armed Forces From Young County Texas". We did not find him located on the picture pages of the book. This information and picture was supplied by his family and we thank them.